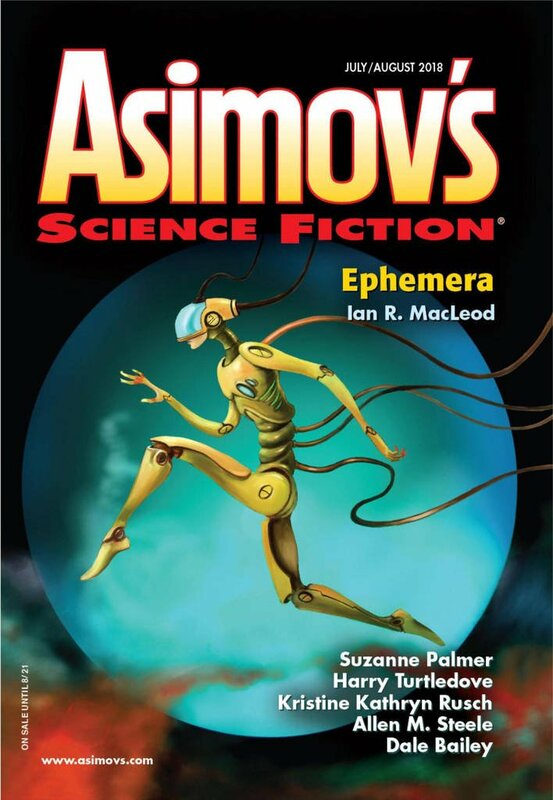 "Ephemera," by Ian R. MacLeod [bio] (edited by Sheila Williams), appeared in Asimov's Science Fiction issue 07-08|18, published on June 15, 2018 by Penny Publications. Pro: KAT’s relationship with Dr. Nungarry is quite moving. The descriptions of how civilization on Earth ended are sobering. KAT’s decision to die with the Argo rather than explore space with the AIs is sad. Con: When KAT meets the AI, the story collapses, and the long lecture from the AI is tedious and boring. Beyond that, there’s not much of a plot to redeem the story. The idea that the destruction of Earth was somehow survived by an emergent AI is really hard to credit. KAT struggles to keep the Argo running, and she doesn’t have anyone shooting at her. KAT’s behavior is a strange mix of human and robot. For example, most of her English is flawless, except for always saying “I, KAT” instead of just “I.” She comes across as a human being with a few quirks rather than a believable AI.